Hello, I’m Sacha Chua, and this is an Emacs Basics video on customizing Emacs. Emacs is incredibly flexible. You can tweak it to do much more than you might expect from a text editor. This week, we’re going to focus on learning how to tweak Emacs with M-x customize and by editing ~/.emacs.d/init.el. After you run M-x customize, you’ll see different groups of options. Click on the links to explore a group. Click on State and choose Save for future sessions. This will save your changes to ~/.emacs.d/init.el. When you’re done, type q to close the screen. You can also jump straight to customizing a specific variable. For example, if you want to change the way Emacs handles case-sensitive search, you can use M-x customize-variable to set the case-fold-search variable. By default, case fold search is on, which means that searching for a lower-case “hello” will match an upper-case “HELLO” as well. If you would like to change this so that lowercase only matches lowercase and uppercase matches only uppercase, you can toggle this variable. I like leaving case fold search on because it’s more convenient for me. If you make lots of changes, you can use the Apply and Save button to save all the changes on your current screen. Not sure what to customize? You can learn about options by browsing through M-x customize or reading the manual (Help > Read the Emacs Manual or M-x info-emacs-manual). You can also search for keywords using M-x customize-apropos. The Customize interface lets you change lots of options, but not everything can be changed through Customize. That’s where your Emacs configuration file comes in. This used to be a file called ~/.emacs in your home directory, and you’ll still come across lots of pages that refer to a .emacs file (or “dot emacs”). The new standard is to put configuration code in your ~/.emacs.d/init.el file, which you can create if it does not yet exist. This code sets C-c l (that’s Control-c l) to run org-store-link, C-c c to run org-capture, C-c a to run org-agenda, and C-c b to run org-iswitchb. You can add those to the end of your ~/.emacs.d/init.el file. They’ll be loaded the next time you start Emacs. If you want to reload your ~/.emacs.d/init.el without restarting, use M-x eval-buffer. Emacs Lisp may look strange. Don’t worry, you can get the hang of it even if you don’t think of yourself as a programmer. You can start by copying interesting snippets from other people’s configuration files. Start with small chunks instead of large ones, so you can test if things work the way you want them to. If you need help, StackOverflow and other Q&A resources may be useful. As you experiment with configuring Emacs, you may run into mistakes or errors. You can find out whether it’s a problem with Emacs or with your configuration by loading Emacs with emacs -Q, which skips your configuration. If Emacs works fine with your configuration, check your ~/.emacs.d/init.el to see which code messed things up. You can comment out regions by selecting them and using M-x comment-region. That way, they won’t be evaluated when you start Emacs. You can uncomment them with M-x uncomment-region. Emacs gets even awesomer when you tailor it to the way you want to work. Enjoy customizing it! 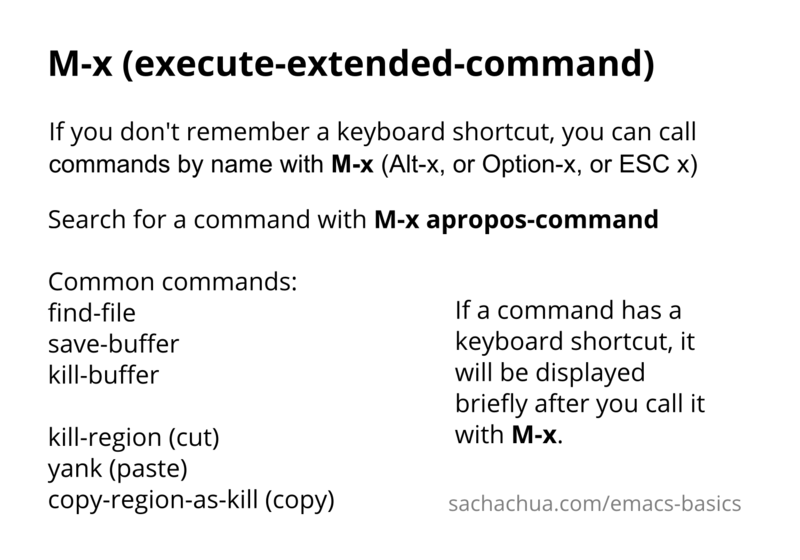 I’m Sacha Chua and this is an Emacs Basics episode on using the mouse. The best way to use Emacs is to master the keyboard shortcuts, but when you’re starting out, don’t worry about them yet. 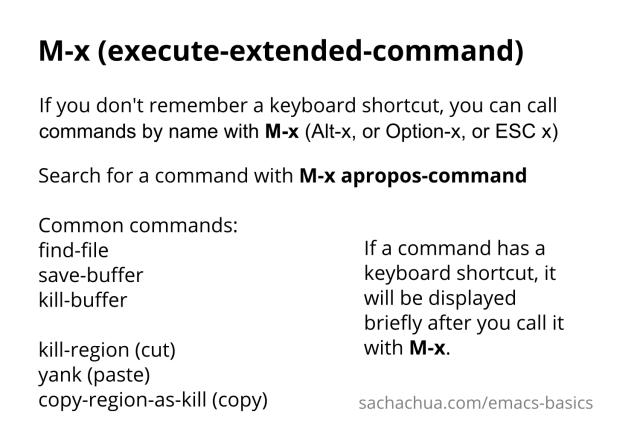 You might find yourself using the mouse a whole lot more than you used to, but over time, you will learn more and more keyboard shortcuts as you get used to Emacs. So let’s say that you’re just starting out. What are some of the things that you can do right away to get the hang of using Emacs? The Emacs tutorial is a great place to start. You can get to that by clicking on the Emacs tutorial link on the splash screen. If you’ve done the tutorial before, it will offer to let you resume at that point. If you don’t have the splash screen handy, you can also get to the tutorial from Help > Emacs tutorial. Go through this and you’ll learn a lot of the common keyboard shortcuts that will come in handy. The toolbar and the menu will also give you quick access to a lot of common commands. If you’d like to create a new file or open an existing file, you can click on the New file icon located in the top left. You can specify the file, and if the file doesn’t exist yet, it will create it. To save the file, click on the Save icon. If you’d like to close a file, just click on the X mark. You can open the file again using the toolbar icon. To copy and paste, use your mouse to select a region of text, then copy or cut it. Then you can paste it wherever you want. You could also search for text. Click on that search button and start typing what you’re looking for. It will highlight the search results. Press Ctrl+s to search for the next instance. Press Enter to stop searching. The menus also offer a lot of other commands. For example, you can insert a file. You can save the current buffer with another file name. You can split your windows so you can see more than one file at the same time. If you’d like to close a window and go back to having one file across your entire screen, you just have to use File > Remove other windows. To switch between the files you have open, use the Buffers menu. Explore the menus for other options. One of the interesting things in Emacs is that you can copy or cut multiple things and then paste them without having to keep copying or cutting each time. For example, if I copy this, then Paste will paste that. But you could also access the things that you copied or cut previously. Just click on Edit > Paste from kill menu, then select the item you want to paste. There are lots of other tools that are available in Emacs. The availability of these tools may depend on what else you’ve installed. Again, for more information, check out the Emacs tutorial or read the Emacs manual.